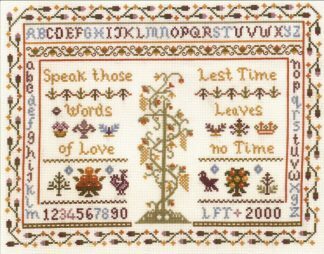 ABC sampler with the comical saying “Work like Helen B. Merry” – a lovely little motto by which to live life to the full ! The alphabet sampler has a delicate border with satin stitch hearts, an alphabet and a variety of stitches in muted antique colours. 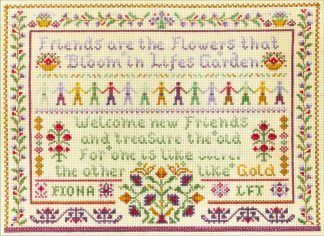 This is interesting to stitch if you wish to try something new. ABC sampler with a funny saying “Work like Helen B. Merry” ~ inspiring you to live life to the full ! A delicate border with satin stitch hearts surrounds an alphabet in muted antique colours. The traditional alphabet sampler has classic stylised motifs in subtle colours of blue, green and gold. 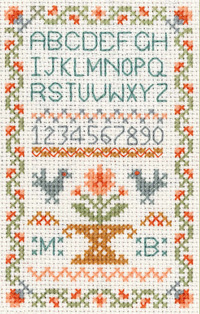 An ABC sampler cross stitch kit with only top quality materials – Zweigart fabric, DMC thread and needle. The kit has full instructions and a clear chart.